“Sunday and Monday are Code Orange bad air days in Delaware.” Plus, the Delaware City Refinery is Belching…..
Below is the official wording from the DNREC. Code Orange bad air is unusual in Delaware in wintertime but does happen. Pollution sources can be as nearby as a neighbor’s wood stove or as far away as a forest fire in Canada or even a dust storm in Mongolia. Actual ground level concentrations depend greatly on weather conditions. “Inversions” can hold pollutants down near ground level. It appears that we are looking at some Code Yellow days following the Code Orange days. Plus, the timing of a big fire at the Delaware City Refinery is poor. This sort of event isn’t factored into air pollution forecasts but will increase pollutant levels in New Castle County and also in Salem County, NJ. In addition to the elevated particle concentrations, the refinery fire, in the “crude unit,” will have released large amounts of nasty sulfur compounds such as hydrogen sulfide and sulfur dioxide. Many people may experience discomfort or worse in the next few days. It appears to us that most Delaware officials are far too servile to the refinery to have anything meaningful to say. 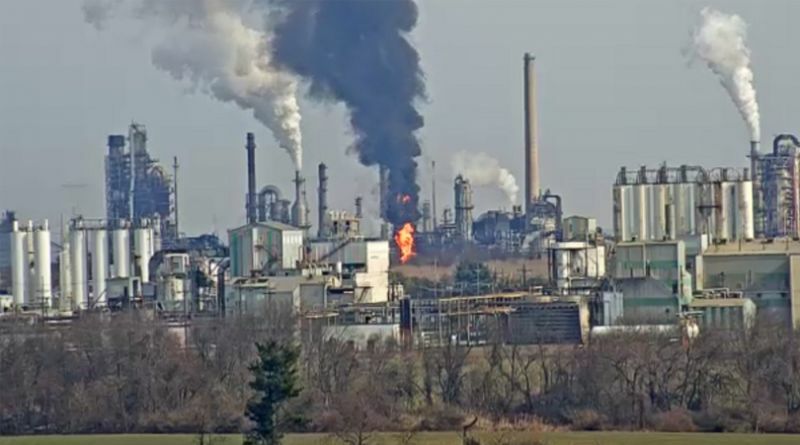 Usually, when there is a fire or explosion or other “upset” in one major unit at the refinery, other operations are also disrupted and begin to belch pollutants. The crude unit is near the beginning of the processing operations so it is hard to be sure what the downstream impacts are. We are told the refinery is still operating. There has been flaring. We also understand the fire was caused by piping failures, which would usually indicate neglect of maintenance. Of course, air quality forecasting, like weather forecasting, has greatly improved but remains an inexact business. Actual conditions can turn out better or worse than forecast. Sunday and Monday are Code Orange bad air days in Delaware. Sunday, February 3, is forecast to be Code Orange for particulate concentrations in Delaware! Particle concentrations rose much faster than expected on Saturday morning, due to an extremely strong surface inversion enhanced by Friday’s snowfall. As of 2 PM Saturday, hourly particle concentrations are dropping in response to increasing surface winds and a break in the strong temperature inversion at the surface. Daily average particle concentrations will end up in the upper Moderate for Saturday, however, which is much higher than normal for this time of year. **Sunday’s Forecast: Sunday’s weather conditions are expected to be extremely stagnant. Surface winds will be calm all day. Another very strong morning surface inversion will form, but the difference from Saturday is that this inversion is not forecasted to break in the afternoon. As a result, atmospheric mixing will be minimal for the entire day. Given how quickly particles rose on Saturday, in conjunction with the very stagnant forecast, particle concentrations will reach the Code Orange (Unhealthy for Sensitive Groups) range on Sunday. A Code Orange air quality forecast for ozone is a level of pollution that can be unhealthy for sensitive groups, such as young children, the elderly, and those with heart and/or respiratory conditions. Such persons should limit outdoor activities, especially those that require a high level of exertion. Any health related questions should be directed to the Division of Public Health at 302-739-6619. All other questions should be directed to the Division of Air Quality at 302-739-9402. Monday, February 4, is forecast to be Code Orange for particulate concentrations in Delaware! Monday is an Air Quality Action Day for the State of Delaware for Code Orange (Unhealthy for Sensitive Groups) fine particles! The state is in the midst of an uncommon, but not unprecedented, wintertime poor air quality event. High pressure over the Mid-Atlantic region and warm air arriving aloft has promoted high particle concentrations all along the I-95 Corridor over the weekend, including across Delaware. Very stagnant weather conditions will persist on Monday. Surface winds will be calm, and an extremely strong surface inversion will inhibit vertical mixing. Given these factors in conjunction with the increase in local pollutant emissions on Monday due to weekday traffic, a second consecutive day of Code Orange air quality is expected. **Extended Forecast: A weak cold front will move through the forecast area on Tuesday afternoon. Particle concentrations will drop into the Moderate range in response to breezy northwesterly winds and enhanced vertical mixing in the late afternoon and evening. Tuesday’s cold front will move back northward on Wednesday as a warm front, bringing clouds and a chance for rain in the late afternoon to evening. Moderate particle concentrations will continue. This entry was posted in Uncategorized on February 4, 2019 by Alan Muller.